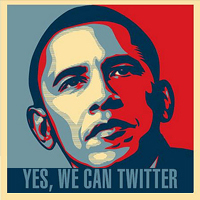 Obama and Social Media: A Direct Reflection of Social Media changes between 2008 and 2012. They say a week is a long time in politics, so imagine how long four years are in social media? As the campaigns of both challenger Mitt Romney and incumbent Barack Obama reached the home straight, there was no question over the importance of a quality social media strategy in both movements. And though Obama now has four more years with which to impress us, one thing of interest was the difference between the 2008 and 2012 Obama campaigns. The Presidents changing online strategies greatly reflected social media and changes in communication that have come about over the period of presidency. When compared to nowadays the social media management and SMS led campaign of four years ago seems quite naive. Some of the most interesting statistics come in the shape of the follower figures. When compared to 2008, even Obama’s social media mobile campaign pales in comparison to todays. The successful 2008 campaign saw over 2m people Like the then challenger; however his Likes currently stand at almost 32m – a rise of 16x. Towards the end of 2008 Facebook’s account share was around the 200m account mark, around a fifth of its current figure of over 1Bn. Twitter has also been attributed to the success of both campaigns, however once more there is a vast difference between the 2008 and 2012 elections in terms of Obama followers. Obama’s current Twitter followers are over the 21m mark. At the time of the election in 2008 the future President had 115,000 followers on the micro blogging site. During the interim period Twitter has grown from around 6m users in 2008 to around 500m as of April 2012 – an increase of over 80 times. According to the figures, in 2008 Obama managed to reach 5m supporters over 15 different social networks, however Twitter, Facebook and YouTube accounted for the majority of these supporters. In 2012 Obama’s Google+ and Instagram accounts make up 1.94m and 1.2m supporters respectively. Both sites are newcomers since the previous election, but together made up a large proportion of the total supporter count of the previous election. One of the other big developments came in the addition of state by state content pages and the use of geo-location. Both parties engaged mobile app development – something that didn’t exist four years ago and both found a range of uses for them. In Obama’s case the Obama for America app is a political organising tool that allows downloaders to interact with like-minded users in their area. These apps were used for accessing information on specific state policies and to locate voting centres nearby depending on geo-location. Democratic organisers also benefit and are able to use geo location features to examine likely affiliations and demographics of a specific area they were canvasing in and so prepare themselves for specific questions. The decline of the papers was also very evident in the campaign, with Obama’s team deciding against the use of press clips – a big factor in the 2008 model. The mainstream press seems to have been strictly limited and Obama’s website has no ‘news’ section any longer. During the campaign news came from the campaign itself and the ‘Truth Team’. This section is used for criticism of Romney and his policies and plans and reaches out online and via social media. When compared to the campaign of only four years ago, it’s very evident how social media management, strategy and marketing has advanced and is central to our world. One has to ask what will social media in 2016 bring? How do you think social can progress? What is the state of social in 2016 going to look like? Let us know via the comments.